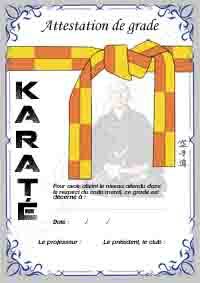 grade proof for the orange yellow belt. Shipping time: 24h / 48h after confirmation of payment (excluding holidays). This product is shipped e n colissimo to the metropolis France and internationally. Payments accepted: Credit cards, Paypal account, check (only since the metropolitan France and overseas departments), or national internationnal bank transfer. All défectieux equipment is replaced (France and international included). Invoice available and printable from the client account.